The Kinship War: My Big Chance, or Where the Rubber Meets to Road: Part 1. First off, sorry for the hiatus. I have been really busy with a bunch of projects. Liberty Con is coming up, so I will continue to be busy. And in mid-July I will be going back out to Nevada, traveling through Death Valley, then over into Southern Utah and Northern Arizona, visiting a bunch of National and State Parks. I’ll have a bunch of blogs out after that. But first, this short history of my career in self-publishing, and the opportunity in traditional publishing it has opened up. Last week I received an email from my editor, who has been working with me on the outline of my traditionally published series, which now also has a name, The Kinship War. Not to talk too much about the series, or the significance of the name, which took many weeks of brainstorming to come up with. I have permission from the publisher, Shahid Mahmud of Arc Manor, to talk up the series, but I still don’t want to give away too much at this time. But back to the editor, who wants me to start writing the series, so we can go over it chapter by chapter as I finish each. Hooray. And let’s bring on the anxiety. This is it. I have to produce, I have to live up to the expectations of so many people that are placing their faith in my being able to produce a possible best selling novel, followed by another. I have a contract for two books, and hopefully the series will go from there, with many other writers contributing to a shared universe. But it all starts with me. I develop the background, build the world, and establish the ground rules. What an opportunity, and a responsibility. Not that I haven’t built very detailed worlds before. Exodus: Empires at War, Refuge and others were very detailed, with hundreds of thousands of words and hundreds of drawings that have never made their way into the novels. But this is different. It has to pass muster. And if this opportunity isn’t enough, I have also had a manuscript requested by the senior agent at a top agency, which is in the process of being proof read before I send it off. The manuscript was also requested by a senior editor at a major science fiction publisher, but it will go to the agent first. And both agent and editor have asked what else I am working on, which hopefully means that they will be interested in something else if they don’t like this fantasy. How did I get here? Good question, and I’m glad you asked (though you didn’t, but it makes me feel better to play that game.) I have been writing since 1996, when I wrote first a non-fiction book, then an alternate history, The Convoy, which was extremely well researched and very poorly written. I sent The Convoy to St. Martin’s Press, expecting to hear back from them with a $100,000 check. A year later I got a rejection slip. I had a lot to learn. More novels followed, and a lot of short stories, followed by a string of rejection letters, or in most cases, small form slips that they could easily place in the self-addressed stamped envelopes I sent along with the submissions. The rejection letters started getting better for the most part. It showed that I was improving, but they were still rejections. On December 31st of 2011 I placed two novels that had been rejected by publishers and agents years before. The Deep Dark Well, far future space opera, and The Hunger, a vampire horror/urban fantasy novel. I released more books, since I had a backlog. Daemon, Aura, Diamonds in the Sand. And then I had months of seeing a couple of books sell, and getting royalty payments of $10 to $20 a month. Not exactly living the dream. In September of 2012 I tried something and things began to change. I did a giveaway of The Deep Dark Well, and followed the instructions I had read online about how to do one properly. I contacted about twenty sites that promoted giveaways and requested that they do my book, which included putting the book on their websites, and in some cases tweeting them. I also blogged and tweeted, and sent out tweets with about forty twitter addresses of sites that would retweet. I gave away over 4,100 books in five days, and cracked the top 20 free books on Amazon. In October I published Exodus: Empires at War: Book 1, with Book 2 already written and ready to go. I wish I had done some different things with those first two books, but I was still learning. The great thing about self-publishing is you have control of everything. The worst thing about self-publishing is you have control of everything. When I first started self-publishing I was really broke, barely making it each month, so I had no money for cover design, editing, all the things the in the know people tell you are must haves. So I made my own covers, and some were awful (see my first effort for The Hunger, which was one of the worst thirty ever on Amazon according to one blog). There were a lot of typos, and I did my own thing without any feedback. I also released the first two books of the Refuge series, written in 2010, the same year I wrote the two Exodus books and three others, while working full time. Like I said, I really wanted out of that job. Still, when Exodus, one of the first books I had ever written right from the start for self-publishing, came out, it sold almost a thousand books in October. September had seen about four hundred and fifty books, ten times what I had sold in the previous eight months. October saw almost a thousand, November two thousand, December five thousand, and January of 2013 saw almost nine thousand books leave the Amazon and other booksellers’ harddrives. In January I was selling up to two hundred books a day between Exodus: Empires at War: Books 1 and 2. In February I sold over five thousand books, and was thinking about quitting my day job at the State of Florida. I hated that job, and wanted out. At first I figured that I could quit by the Fall, then I moved it up to the end of March. Then, after the first day of March, I decided to turn in my two week notice. They were surprised. A lot of people had talked about moving on to something better, and some had while I was there, but it was rare. It was an anxiety provoking decision. The job guaranteed me a steady paycheck, able to pay rent, pay for my car and buy food. It also came with benefits, health insurance and a pension. But, because of laws passed by the State on the pension, I was actually making less than I had five years before, and there was no sign of a raise in sight. They were also talking about raising the employee contribution to health care, which meant still less money. So I walked out and never looked back. I had a lot of friends there, some of whom had written reviews for my first couple of books. I returned for one retirement party, and that was it. So now I was a full-time author, and started to work on Exodus 3. The mistake I made with that book was listening to a fan who said I needed to make my books longer, or it would take forever to finish the series. I wrote two hundred and twenty thousand words, and covered about two weeks of time. But it was a learning experience. You can’t write twice the book and charge twice the price. Maybe when I get some traditional series where writing very long books pays off I’ll try again. 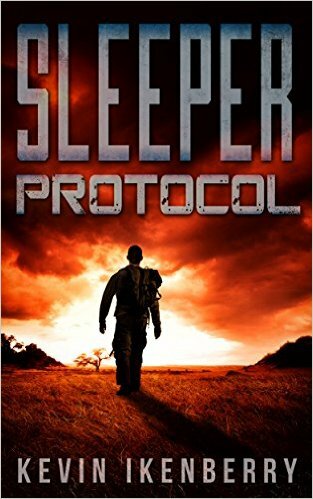 The book hit number one in space opera on Amazon UK and number two in the US, and eventually sold fifteen thousand copies. I also started thinking about going to cons. I had never been to one, though I had been an avid reader and watcher of everything scifi and fantasy, and even a lot of horror. First, I went to Altcon, a small convention in Tallahassee that offered little above vendors. I went to one panel on self-publishing, raised my hand, and probably talked more than the poor woman who was running it. A friend at work had talked about Dragon Con, so I went online, bought a membership and booked a hotel, and was ready for my first con. I even got a costume, Indiana Jones, and registered for Jody Lynn Nye’s workshop. Dragon Con was amazing. The first day was the workshop, and Bill Fawcett, Jody’s husband, who I had never heard of before, said at the beginning of the workshop that one manuscript had really caught his attention. Cool. I hoped it was mine, but didn’t think about it again until the next day, when they gave our manuscripts back to us. Mine was the first chapter of Theocracy, written in 2012 and published in 2015. Bill handed me my manuscript and told me he was talking about mine the first day. I was invited to meet with him, and did the next day (and that is a story in itself). He brought me up to the VIP suite, where I met some big name writers, and went over what he thought were my strengths and weaknesses. At the end of the meeting he said he thought I had a bright future. I also met Kevin J Anderson and his wife, Rebecca Moesta, at the workshop. They were impressed by my sales (I had sold 48,000 books in the year since September of 2012). 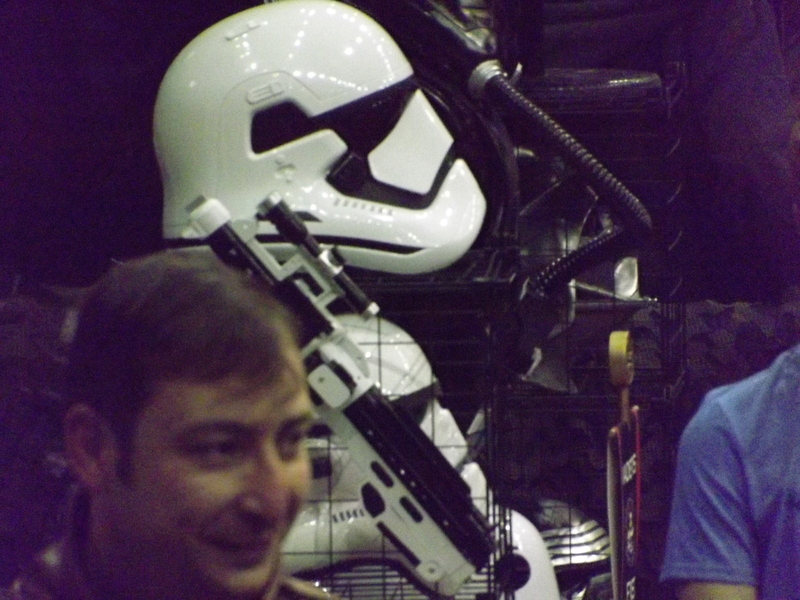 I asked him later at the con if he would consider me for his next military scifi anthology. I also went to a panel where five big time authors all got off topic and started talking about how they made it big in the business. All mentioned Bill Fawcett as being one of the major influences of pushing them to the next level. I talked with Todd McCaffrey, who I also met at the workshop, and asked him if it was a big deal being asked by Bill to talk. He thought so. And I got to talk with Robert Sawyer before a panel. The next year, 2013, went well. I sold almost another 50,000 books, Exodus: Empires at War: Books 4 through 6 were released that year, and all hit number one in one or more subgenres of science fiction in the UK, top five in the US. I released some other books, some did fairly well, some not. My space opera was doing much better than my fantasy, and if I was only about the money I would have totally concentrated on the space opera. But I wasn’t. I figured I needed to put out three money makers a year, and the rest could be things I just wanted to write. One of my fans, Larry Southard, talked me into going to Liberty Con in Chattanooga. I did a panel at Altcon that year, and met author Ian Malone, who used to live in Tallahassee. I went to Liberty Con as an attendee, and enjoyed the con, meeting Les Johnson, Chuck Gannon and Mark Wandrey, and Peter and Dorothy Grant, all of whom became friends. I tried to talk my way onto panels at Dragon Con with no luck. I wrote a story for Kevin J Anderson and was published in Five By Five 3. It didn’t sell as well as hoped, but it was still a good experience. That was my first experience with an editor, though Kevin had already bought the story and told me I didn’t have to do anything the editor asked. So it was an easy process. My second Dragon Con was a lot of fun. In the fall I went to Honor Con in Raleigh, North Carolina, and met David Weber and Chris Kennedy. That’s another story. I had gone to two Superstars Writing Seminars, 2013 and 2014. Met a lot of interesting people there, including my friends James Artimus Owen and Dave Wolverton (also known as David Farland). I attended a workshop put on by Dave in Atlanta later that year. Superstars was an interesting experience. I met Kevin Ikenberry, Sarah Hoyt, Ramon Terrell, Raphyel Jordan, Travis Heermann, Quincy Allen, Scott Boone and many others. I did a panel at the first Superstars and got an ovation when I announced who I was and my claim to fame (75,000 sales at that point). I also met with Eric Flint at the VIP dinner. In 2014 I was again on a panel, and ate with Toni Weisskopf. I loved Superstars, and there are many people who go every year. But I thought I had gotten what I could out of it in two years and decided to try other things. Hopefully someday I will go back, maybe as a speaker. Who knows. 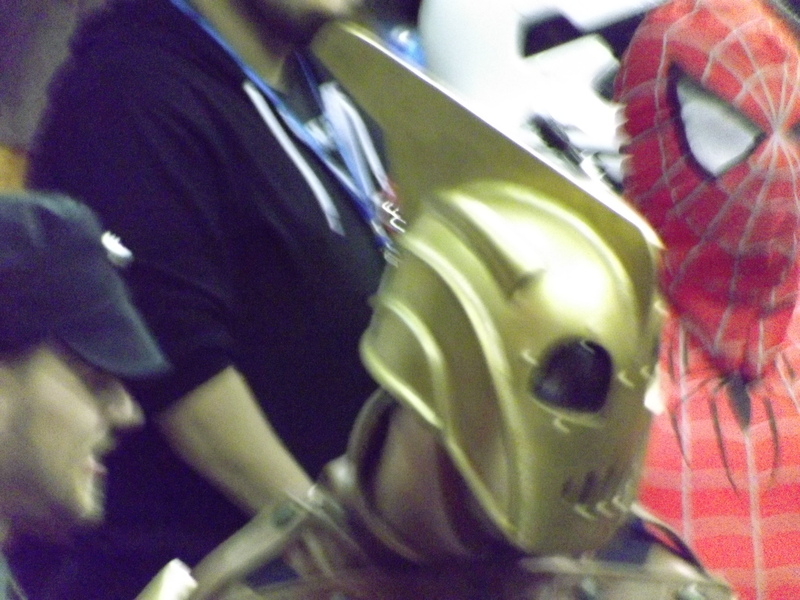 As related in part 1, I really didn’t know much about Pensacon when I decided to attend. I had heard that about ten thousand people had attended last year, it was just to the west of where I lived, and I thought it was worth checking out. I bought a pass, some photo ops, booked a hotel, and off I went. I don’t think I mentioned it in the first post, but the gate actually opened late, after 11 AM, when there were panels scheduled for 11. Same this day. I thought this was poor planning, as I was sure there were people there that wanted to go to those panels. This time I at least knew to avoid the line of people who were in line to buy passes. So I got into the line that seemed to be waiting in vain for the doors to open. Finally, at about 11:05 AM, they opened, but now we had to pass through bag and weapons inspection. Compare this to DragonCon, where once your fake weapons were bonded you were free to go where you wanted for the weekend. After the parade there were people checking passes at the entrance to the hotels, meaning they looked at the badges in passing, but people walked in and out with bags without having them checked. Pensacon forbid any outside food or drink, another policy not found at Dragon. And, as in the first day, there weren’t that many panels scheduled. I went to one, a panel of scientists on what constituted good science fiction, which turned out to be more of a list of famous scifi movies, most of which I had seen. One of the scientists from the University of West Florida got up ten minutes into the presentation of the moderator and left. Otherwise, it was a good panel, especially since the moderator agreed with me about Forbidden Planet being the best of the best. Next panel was about publishing, and I made a new friend in author Troy Denning after the panel, getting a book signed, HALO: Last Light, which I have since read and highly recommend. Then it was on to the photo op. I had wanted to meet Claudia Christian in person, who I had met on Facebook, and I had received a very nice photo of the Babylon 5 cast signed by her. I remember looking up photo ops at Dragon, and many of the celebrities were charging $80 for a photo. Claudia and Bruce Boxleitner were each charging $40, so I decided to get one with each of them. I knew from Dragon that photos and autographs were a major revenue source for celebrities, and I didn’t begrudge them making some money. But what I didn’t expect was how a photo op was run. I thought I would get to shake hands, exchange some pleasantries, and get a picture taken. I was the first in line at the time that both stars were supposed to do photos over a fifteen minute period. Most were there to get a combined photo with both stars, maybe six to get individual pictures with Bruce, and I was the only one there to get a photo with Claudia alone. So they rushed through the people who wanted the group photo, then Bruce. I went last for him since I was going to get a photo with Claudia right after. I was ushered in, stood next to Bruce, had my picture taken, and was ushered away, all in about ten seconds. Same with Claudia right after. To say it did not meet my expectations would be understatement. Next I went to see Bruce and Claudia on a panel at one of the theaters that served as large panel rooms for the con. It was a good panel, but again offered no chance to actually meet the stars. You could ask a question, if you wanted to wait in line to get to the microphone. Still, it was a good panel, and after it was over I decided to get something to eat. And after that, it was back to the hotel to do some writing. There really weren’t a lot of activities at night that I was interested in. They had a bunch of themed parties that I guess lasted into the early hours of the morning, but as I don’t drink they really weren’t of interest. But I did get two thousand words done that night. 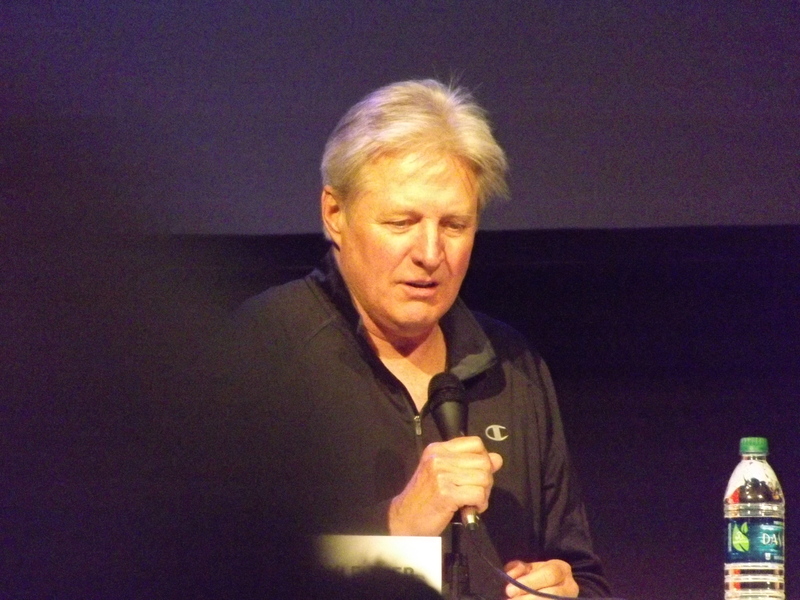 The next day I started out going to the autograph area to get Bruce Boxleitner’s autograph. He was sitting with some young woman and no one waiting in line, so I finally got a chance to talk to one of the stars of one of my favorite science fiction series. I found him to be very personable, and I actually got him to take one of my cards. Who knows, I doubt it will amount to anything, but I could end up getting a review. One thing I have learned as an indie is you have to ask and take advantage of opportunities. Otherwise, nothing happens. I then went to a panel with Kevin J. Anderson. I’ve heard the story he told several times in the past, but Kevin tells a good story with humor, and I like supporting him, so it wasn’t a bad way to spend forty-five minutes. After, I went to sign some copies of Five By Five that were on display at the Wordfire Press table. 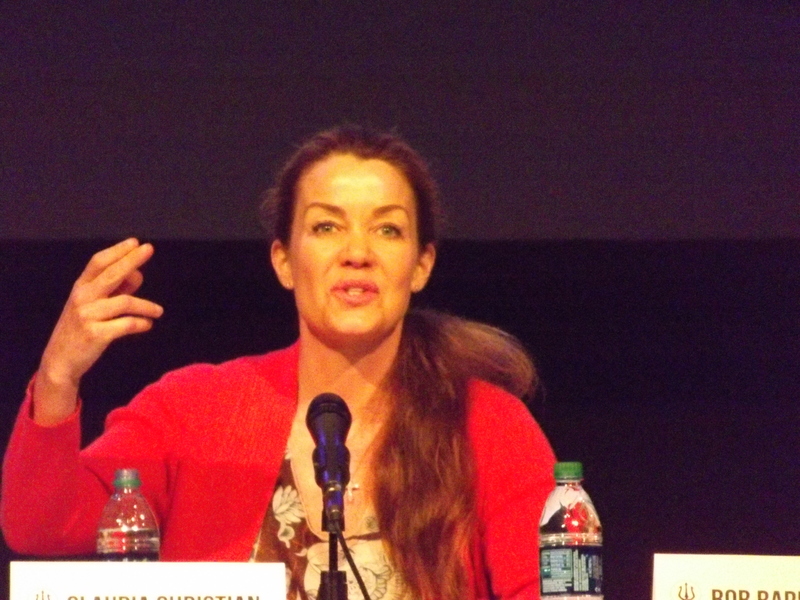 And there I finally got to meet Claudia Christian. I bought her book, and when she asked who to sign it to I showed her my pass. And to my delight, she smiled and said she recognized that name and now had a face to put with it. We talked for about five minutes, and then I let the next fan have her. 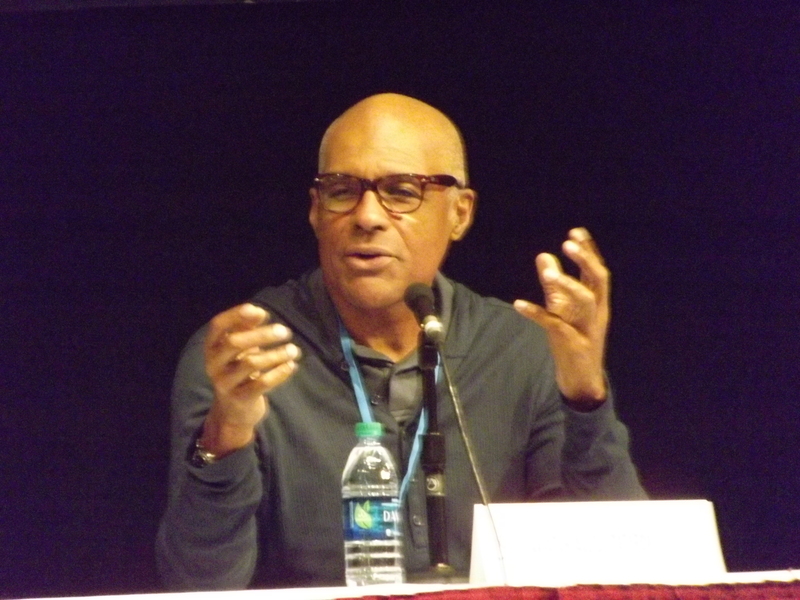 My last panel of the day was at the other theater used for the Con, with Michael Dorn, better known as Worf. Interesting guy and a great panel, and a good one to end the Con with. On the drive home to Tallahassee I thought about the Con. It hadn’t been a bad experience, and I did have a good time. My one real complaint was the lack of panels. Most times there was only one, other times two going. The most I saw at one time was three, and not all of them were of interest to me. At Dragon and Liberty there were always panels of interest, and the problem was deciding which one to attend. At Pensacon I went to some that I really wasn’t all that interested in, since there weren’t a lot of choices. Still, this was only the third rendition of this Con, and I figured it would get better as time went on. After all, though it wasn’t a huge Con, it still had respectable numbers. Two days later I received an email from Pensacon, in which they explained that the venues they used would not let them book for next year. So they might have been destroyed by the people who control their venues before they really had a chance to get their feet under them. Hopefully they will work something out. Would like to see how this Con grows in the next decade or so. Kevin Ikenberry’s book Runs In The Family, and a contest. 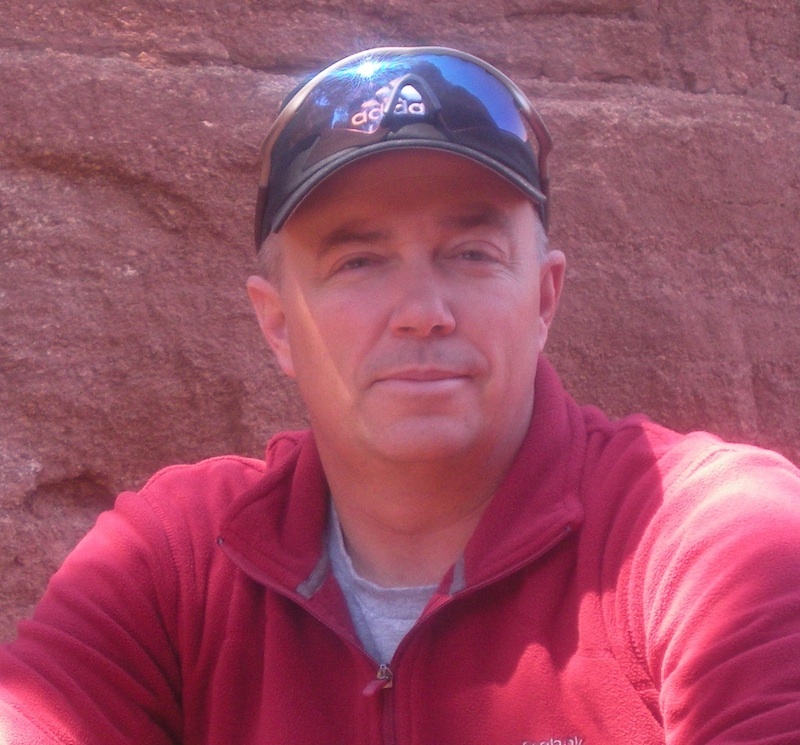 My good friend Kevin Ikenberry, newly retired from the Army, has republished his book, Runs In The Family, which will have a blog entry here soon. Kevin is an ex-armor officer, so for all you tankers out there, you might want to check him out. He is running a contest to design Mairin’s (the heroine of the novel) Challenge Coin. Details below along with a link. A tradition of Western military service is the challenge coin. Typically presented by a commander to those who perform in an outstanding manner, challenge coins have a long, treasured history. Once given, especially of a particular unit, it is to be carried all the time. Should someone present their coin and challenge you, you must produce your coin or you will owe the challenger a drink of their choice. Challenge coins have evolved in the last few decades from simple brass coins to embossed, custom designed coins that have actual physical uses like opening bottles. The tradition remains unchanged and fans of the military science fiction novel RUNS IN THE FAMILY have a unique opportunity to create a one-of-a-kind design to be sold with copies of the book at signings and special events. Mairin Shields commanded the Regimental Cavalry Troop of the Terran Defense Forces at the Battle of Libretto, and their march to glory deserves to be commemorated with a commander’s coin. Your challenge is to design Mairin’s coin. Anything in the novel is in play, but please keep in mind that coins are honorable gifts and should not contain foul language, images, or inferences. Create a challenge coin design. Coins can be any design but should be sized to fit within the palm of an average hand – most coins are around 1 3/4 inches in diameter. Submit the design as a photo in jpg or png format to contest (at) kevinikenberry (dot) com by no later than April 7, 2016. A winner will be chosen by April 10th. Winners may have their final design altered by the award committee to best reflect the scope of the contest. Coins can be simple or intricate. The best coin design will win. Coin designs will be judged on originality, cavalry traditions, understanding of the story, and creativity. The judges will include the author, the publisher, and a committee of soldiers and officers familiar with said traditions. Each artist is allowed only one entry, so send us your best design. That being said, try to send in a color image of the coin design or very clear directions as to the colors you would have in the design. We’ll take black and white designs, and pencil designs, but we’re drawing the line there. Entries received after midnight, US Mountain Daylight Time on April 8th will be disqualified regardless of how awesome they could be. Please be prompt with your submission. For your entry, in the body of the email include your name, shipping address, and a valid email address that you check often. Also, sign up for Kevin’s newsletter – that’s how we’ll announce the winners, so you’ll want to do that. You can find the newsletter signup at www.kevinikenberry.com. The Grand Prize in the contest is a $25 Amazon gift card, a personalized copy of RUNS IN THE FAMILY, five challenge coins featuring the winner’s design, a creator’s certificate, and a collection of signed books from Strigidae Publishing. Second prize will receive a personalized copy of RUNS IN THE FAMILY and a collection of signed books from Strigidae Publishing. As we judge the contest, we encourage you to visit the store where you purchased RUNS IN THE FAMILY and leave a review. It doesn’t have to be much, but every single one helps. While you’re there, check out Kevin’s other works, too. Troy Denning’s HALO: Last Light. I wasn’t very familiar with HALO, having never played the game or read a book, my only experience a couple of movies. I had never heard of Troy, but met him at a panel at Pensacon. Later I saw him at the Wordfire Booth on the vendor floor. I asked him which if his books he would recommend and he asked if I wanted something gritty. HALO: Last Light was a gritty, action filled, well written military science fiction tale. I thoroughly enjoyed it, and highly recommend it. It will not be the last of Troy’s books that I read, not the last of the HALO series.